I found myself reflecting on the plane to Las Vegas about some of the key aspects of the Socially Dynamic Organisation: it will be reconfigurable, hold a diversified strength, strongly tribal, and highly authentic. When an organisation is reconfigurable, it holds it’s strength in it’s fluidity: a fluid hierarchy that is diagonally connected. This means it’s more interconnected, stories flow between levels more easily, not simply dictated down the chain, but flowing upwards as well. Diagonal storytelling abounds, with active story listening a common feature: all of this is hard to achieve, as it requires formal leaders to re-examine their relationship with established power. When we hold diversified strength, an organisation is permeable to expertise, both in terms of accessing community held knowledge, and contributing knowledge into those communities. It is impermanently bonded: the structures of power, that act as forces of control within, are flexible. More fluid functional structures, shaped more around purpose than utility. A Socially Dynamic Organisation will be restless, not counting the strength that it has, but always consider the strength it needs to earn. 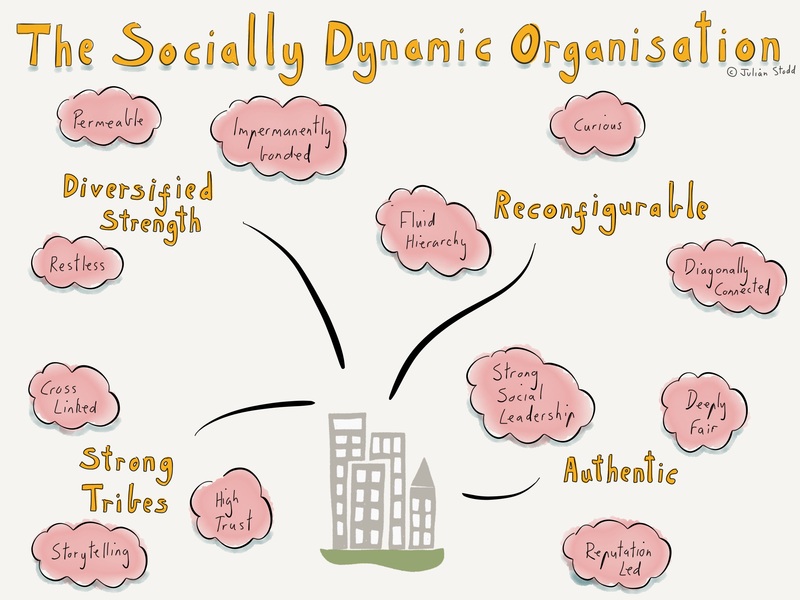 All organisations have strong tribes, but often held invisibly: to be Socially Dynamic, we support and enable people to build strong Social Capital, to seek out, find, join, or dismantle, these tribal communities. Our strength can be measured in the cross connectivity between these, crossing through first and second degrees of trust, and beyond. Most of all, authenticity will be valued as a genuine type of power: hard earned, nurtured, and available to anyone through Social Leadership. Reputation based power, granted by the community. 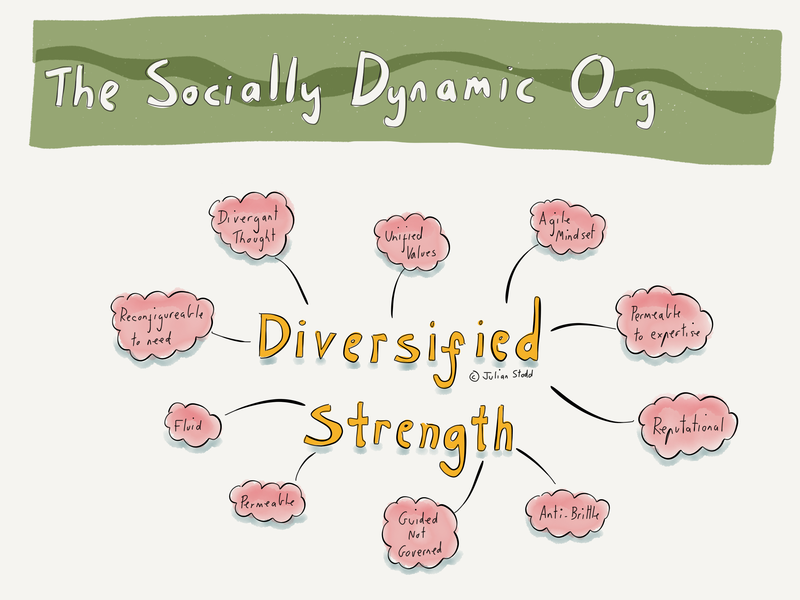 This is the nature of the Socially Dynamic Organisation: it’s held together with fairness, respect, pride, and trust. Not bonded by power and control alone. It’s a new form of power for a new time, the Social Age. Technology will not grant us this organisation, and neither will any formal leader: we have to build it, together. As formal leaders, we can set a direction, and we can hold open a space for change. This entry was posted in Social Capital, Social Leadership and tagged Agility, Change, Respect, Social Leadership, Socially Dynamic Organisation, Strength. Bookmark the permalink. I found myself thinking about the NHS in response to this post Julian. Clearly it is far from being a socially dynamic organisation in the way you mean it. But the NHS is highly tribal and highly authentic. And in some ways it has a huge amount of diversified strength although again not perhaps in the way you mean it. It is clearly not easily configurable – a consequence of its multiple conflicting accountabilities, together with the very high and explicit risks of getting things wrong. But three out of four is not bad. Yet as I said clearly not socially dynamic. Any thoughts on this? I am actually just starting a large project in the NHS, looking at how we establish the conditions for Communities of Practice to emerge: i will be #WorkingOutLoud throughout the project, which will involve interviewing across tribes. I will be interested to see how your NHS works goes. I’m sure you’re right about how the tribes within the NHS remain culturally distinct. One response would be ‘you guys have got to stop being so tribal/tell more diagonal stories’. Which might work. But I suspect tribes are tribal for a reason. And that for the NHS it’s about the construction of an ‘us’ amidst a stressful and monolithic, yet diverse, hierarchy. All driven by historically and culturally validated and constrained professions. If so the answer might be more about telling ‘bigger stories’ than diagonal stories. I was often struck when in NHS policy disccsussions that asking the question ‘whats best for the patient here?’ would engender a pause, a change of gear, followed – often – by people setting aside their tribal battles for the bigger story to which everyone was implicitly committed. I think there is a lot of truth in all of this. See yesterday’s post about ‘primary’ and ‘secondary’ cultural alignment: i don’t think that that work is perfect yet, but there is something about the way we form tight, local, strong trust bonded tribes, and how they co-exist in a larger, more loose, ‘community’ frame. Hmmm… getting dangerously close to thinking about a taxonomy of organisation. I might write some notes on that. I strongly agree with you on the four aspects that thrive in socially dynamic organization. We are organization which can function effectively if the diversified strengths are harnessed. We provide potable water to rural communities in Ghana. Every staff is important to the execution of the project goal.